Get paid to help minimize strain on the electric grid and keep electric rates down! Rush Hour Rewards is a demand response program that allows members to earn money for decreasing energy consumption during peak demand periods (or Rush Hours) with their eligible Nest thermostat. Once enrolled, your Nest thermostat will notify you of any upcoming Rush Hour events, and then automatically adjust the temperature to reduce the overall demand on the electric grid when it’s expected to be at its highest. SIGN UP IS CURRENTLY OPEN. Please note, you must have a Nest login set up and a Nest thermostat installed before you can subscribe. Visit Nest.com/GVEC and follow the steps listed in the “How do I enroll in Rush Hour Rewards?” dropdown below. For more information, see our FAQ’s below or call a Customer Service Representative at 800.223.4832. What is a demand response program and why is it valuable? Demand response programs help lower the overall demand for electricity during peak times (days/hours the highest levels of energy use occur). The more GVEC can lower its demand during seasonal peaks, the more GVEC will save on transmission costs—plus reduce strain on the power grid. This translates to more stable Generation & Transmission rates for our members, which are the wholesale power costs passed through with no markup on their monthly bill. How can a Nest learning thermostat benefit me? Nest’s learning thermostat was the first thermostat to get ENERGY STAR certified. According to Nest, it can help save from 15-20% on electric costs by learning what temperature you like based on your settings, and then building a schedule around your habits. It also allows you to adjust the temperature in your home from anywhere using your smart phone, so you can set it to a cost-effective temperature when you aren’t home and view how often your HVAC system is running. It puts even more money in your pocket through our Rush Hour Rewards program, earning you a one-time $85 bill credit when you sign up, and another $30 each year you’re enrolled through September 30! What kind of rewards can I expect through this program? 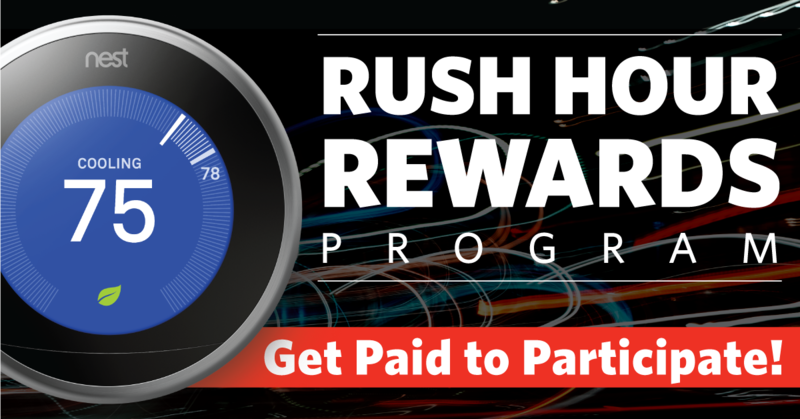 Members can receive Rush Hour Rewards credits for all qualifying thermostats, including multiple enrolled thermostats at a single location. Which Nest thermostats qualify for the program and where can I purchase them? All Nest models are eligible to participate in Rush Hour Rewards, but not all models are compatible with every HVAC system. View Nest’s compatibility tool to determine whether or not your AC system is compatible with your Nest model of choice. Program-eligible Nest thermostats can be purchased from any Nest authorized dealer or at any GVEC office. If you purchase your Nest from GVEC, ask us about our exclusive savings on installation through GVEC Home! How do Rush Hour events work? GVEC will predict a large rise in demand for electricity caused by extreme weather, then schedule a Rush Hour event through Nest. Enrolled members will receive a message on the thermostat and from the Nest App detailing what time the upcoming event will start and end. Before the Rush Hour begins, a gold gear icon will appear on the participating thermostat notifying that the system is pre-cooling or pre-heating, depending on the season. The gold gear will remain present on the thermostat, but the words “Energy Rush Hour” will be displayed. The thermostat will not be adjusted more than two degrees Fahrenheit. Note: The member maintains the ability to manually adjust their thermostat at any time during the event. When the Rush Hour is over or if Nest senses more than a 2˚ difference from the original setting, the thermostat will return to its regular schedule. Rush Hours typically happen on very hot summer days when most people’s air conditioning units are trying to keep their homes and businesses cool. Members can expect to see no more than 25 events from June-September, but this number will depend on overall weather patterns for the season. Members shouldn’t expect more than one rush hour event a day or more than three consecutive days in a row. Am I eligible to enroll in Rush Hour Rewards? How do I enroll in Rush Hour Rewards? Go to Nest.com/GVEC, enter your zip code in the search bar and select GVEC’s rebate program. Then click the I’m done button on the bottom of the page. Once your information is verified, Nest will send a confirmation email. This may take a couple business days. Go to Rebates and rewards >Nest rebates and rewards. Call a Customer Service Representative at 800.223.4832 if you have any questions. Take a look at the many ways we can help you live a more energy-efficient life…and save money on your energy bill, too. Learn more about our programs and services for you and your community. We offer educational presentations, scholarships for graduating high school seniors, meeting facilities for nonprofit organizations and more.